with lotus form bobeches. Sconces may be mounted horizontally or vertically. Very good condition, with age appropriate wear. Unique - for the true lovers of real rarities! 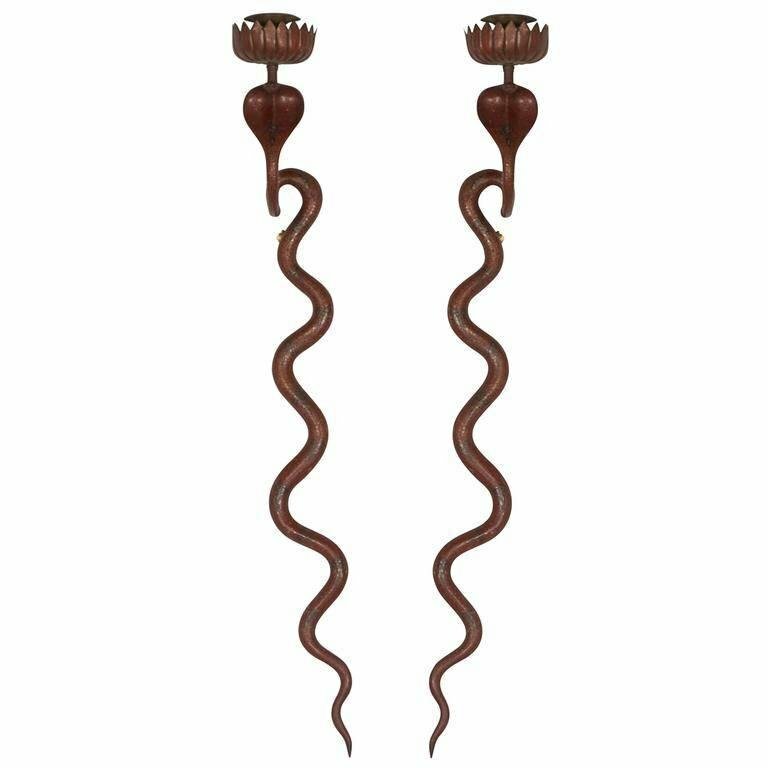 It is our pleasure to present to you this amazing pair of XIX century hand-hammered silver double-armed candle wall sconces in the Spanish Baroque style. The back plates are beautifully adorned with the Spanish royal crown and personal monogram of Amadeo I, the King of Spain. The heraldic composition is completed by the sculptures of angels, holding a laurel wreath in each hand, a symbol of royal power and victory. Probably, made by a special order, the sconces are unmarked but tested for silver. The original wooden bases of the back plates, intended to be mounted on the wall are preserved in a good condition on both candelabras, with all of the original copper studs that the silver parts are nailed to them. Very good antique condition, although there is a common minor wear consistent with age and use. Please refer to photographs attentively, as they are part of the description, as well. Is it possible that these silver sconces at one time had decorated the walls in the King's apartments ? Amadeo I (Italian Amedeo, sometimes anglicized as Amadeus) (30 May 1845 – 18 January 1890) was the only King of Spain from the House of Savoy. He was the second son of King Vittorio Emanuele II of Italy and was known for most of his life as the Duke of Aosta, but reigned briefly as King of Spain from 1870 to 1873. He was elected by the Cortes as Spain's monarch in 1870, following the deposition of Isabella II, and sworn in the following year. Amadeo's reign was fraught with growing republicanism, Carlist rebellions in the north, and the Cuban independence movement. He abdicated and returned to Italy in 1873, and the First Spanish Republic was declared as a result. Granted the hereditary title Duke of Aosta in the year of his birth, he founded the Aosta branch of Italy's royal House of Savoy, which is junior in agnatic descent to the branch descended from King Umberto I that reigned in Italy until 1946, but senior to the branch of the Dukes of Genoa. The Spanish Royal Crown, known as Crown of Alfonso XII, is the symbol of the Spanish Monarchy and has been used in proclamation ceremonies since the 18th century. The current Spanish Royal Crown is the crown of the ruling Bourbon Dynasty. The Spanish branch of the House of Bourbon was founded by Philip V of Spain, Duke of Anjou, who was born in 1683 in Versailles. He was the second son of the Grand Dauphin, son of Louis XIV. The last time the crown was shown at a public ceremony was in the Cortes Generales during the swearing-in of King Felipe VI on 19 June 2014 after the abdication of his father, King Juan Carlos I. Since July 2014, the Crown and scepter are on permanent public display for the first time ever in the so-called Crown Room at the Royal Palace of Madrid.